Beading can be as basic or as intricate as you desire to create jewelry pieces that will stand out as beautiful representations of your creativity. Explore some of the many beading patterns for making pieces out of beading thread and tiny seed beads. When you weave these beads together and intersperse them with larger beads, the effect is stunning and lovely. Beginning beaders can learn to make a flat spiral bracelet using seed beads and round crystals. Cut a 3-yard length of nylon beading thread and thread the beading needle onto the beading thread. Pick up two 6 mm beads onto the needle and push the beads along the thread until they reach the end of the thread. Leave a 10-inch tail on the other end of the two beads. Thread four seed beads, one 4 mm bead and four more seed beads onto the needle. Insert the needle back through the two 6 mm beads again from the other side of the beads to create a loop with the seed beads. Pull the beading thread taut. Repeat Step 3 to make a second loop around the first two 6 mm beads, except place the second loop on the other side of the two 6 mm beads. Pick up one 6 mm bead onto the needle and push it along the thread so it is snug against the other 6 mm beads. Thread four seed beads, one 4 mm bead and four more seed beads onto the needle. Insert the needle back through the last two 6 mm beads from the other side of the beads to create a loop with the seed beads. Pull the beading thread taut. Repeat Step 6 to create a second loop around this 6 mm bead, placing the second loop on the other side of the 6 mm bead. Repeat Steps 5 through 7 until the bracelet is approximately 1.5 inches less than your desired finished length. 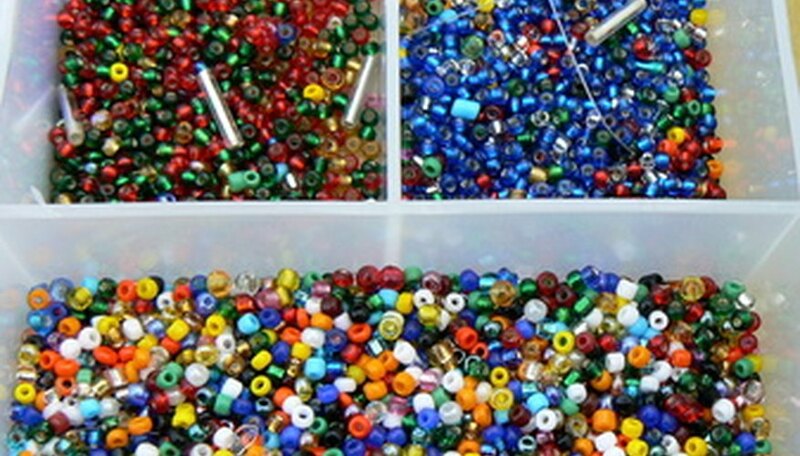 Using all 28 6 mm beads will create a bracelet that is approximately 7.5 inches. Thread three seed beads, half the toggle clasp and three more seed beads onto the needle. Insert the needle through the last two 6 mm beads of your pattern and pull the beading thread taut. Insert the needle back through the beads you strung at the end of the pattern until you reach the point where the toggle clasp attaches to the bracelet. Insert the needle back through five or six beads going the other way and then reverse again. This secures the beading thread before you tie it off. Insert your needle through the beads so the thread extends off from a center 6 mm bead and tie your beading thread off at this point with a knot. Bury the beading thread by inserting it through one or two more beads and snip off the excess beading thread to finish this end of the bracelet. Repeat Step 9 on the other side of the bracelet with the other half of the toggle clasp to finish the bracelet.